Mark Bradford (United States), whose project also opened on Saturday, August 27, abandoned his large-scale collage works, some of which are included in Farsites, to work with yet another subset of Tijuanaí­s population, the "maleteros" (porters) who work the border-crossing area between Mexico and the United States. Concerned with issues of power and visibility, Bradford makes the invisible visible by publicly uniting and acknowledging three disparate groups of porters through signage, insignias, customized equipment, and a storage facility (which is also open to the public as a viewing area). By bringing this group of laborers to the foreground, Bradford publicizes the economic exchange that occurs at the site of the border and the flow of goods and pedestrians within the border region. Similarly interested in the liminality of the border as a region that serves as an interval between the two countries, and the experience lived by its inhabitants, Mí¥ns Wrange/OMBUD (Sweden) created The Good Rumor Project loosely based on a social experiment. 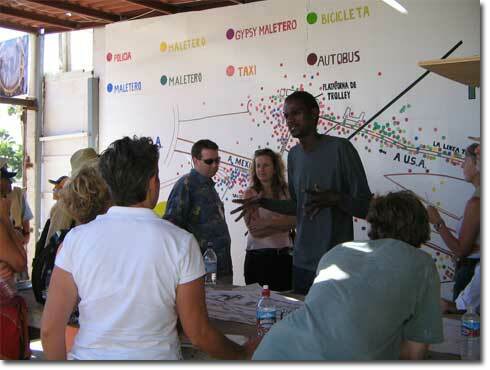 Wrange/OMBUD worked with two focus groups, one in Tijuana and one in San Diego to help devise "good rumors" that would be spread by through "nodes," socially influential people in each city. Through this work Wrange/OMBUD explore the effects rumors have on their recipients reinforcing the "sense of difference between national, ethnic and socio economic groups" while masking the similarities shared by inhabitants of this greater border region. (1) By spreading good rumors Wrange/OMBUD try to dispel myths circulating about each community so that the residents could move closer to understanding one another and the issues present in both sections of the border. The project includes an installation located on the side of a building in downtown San Diego that consists of two monitors playing a brief silent video about the piece and wall text with the name of projectí­s website www.goodrumorproject.com. This website is where nodes are asked to log in and record their version of the rumor once they have heard it. The artists intend on surveying the nodesí­ backgrounds to see who the rumor has reached and what sort of socio-economic background they come from. By limiting their tracking to the internet they manage to preclude the participation of those without internet access and thereby isolate a segment of the population severely affected by rumors. Although the intervention is not with out of limitations, it too focuses on the flow of information and bodies throughout this regional zone. The space of the border and the movement of bodies within it are also the focus of Hospitality by Felipe Barbosa (Brazil) and Rosana Ricalde (Brazil) who covered one of Tijuanaí­s pedestrian bridges with names as a way to greet locals and tourists who cross it on a daily basis. The flow of goods across the border is the subject of the film project by Aernout Mik (Netherlands) on display in a public parking lot in San Diego. Mikí­s film focuses on a deposit of used cars on Tijuanaí­s hillsides, in addition to interior scenes of a pharmacy, referencing the bulk of pharmacies located on the Mexican side of the border that receive heavy foot traffic from U.S. residents who desire the ease at which prescription drugs can be purchased (and further referencing the larger drug culture of the region). Additional projects opened during the weekend that sought not only to address Tijuanaí­s onslaught of problems but through their community involvement and intervention, present temporary solutions. SIMPARCH, a U.S. art collective, worked with a community in Tijuana and Fundación Esperanza to create the Dirty Water Initiative, a small water purification system, sculpture-like and on view in the pedestrian entryway into Tijuana during the run of inSite. Upon the closing of inSite_05, the purification system will be donated to the community to provide it with sanitary drinking water. Thomas Glassford (United States) and José Parral (United States) cleaned out and then landscaped a portion of Tijuana, located alongside the decrepit fence that separates the two countries, in order to improve the appearance of the area. The viewing platform steers viewers and residents to the Mexican side of the beach rather than to the wall and the territory beyond. The nighttime focus of both Friday, August 26 and Saturday, August 27 was the opening of inSiteí­s first museum exhibition, Farsites: Urban Crisis and Domestic Symptoms in Recent Contemporary Art, which opened at the San Diego Museum of Art Friday night and at the Centro Cultural Tijuana on Saturday night. This bi-institutional, bi-national exhibition was curated by Adriano Pedrosa (Brazil) with five adjunct curators each of whom worked on a documentary project focused on a particular crisis in an American city: Ana Elena Mallet (Mexico City: From Constant Crisis to Failed Modernity: The Nonoaloco-Tlatelolco Housing Project) , Betti-Sue Hertz (New York City: Blackouts 1965, 1977, 2003) , Carla Zaccagnini (Sí£o Paulo: Bridges, Tunnels, and Viaducts) , Julieta González (Caracas: Avenida Libertador) , and Santiago Garcí­a Navarro (Buenos Aires: The Palermo Viejo Assembly) . These five projects, along with the work of 52 international artists who confront issues of both public and private crisis in the urban landscape, are divided between the two institutions and installed so as to integrate works with different foci to allow for new layers of meaning (they are not organized chronologically, regionally or thematically). This is a more static and straightforward exhibition that prioritizes objects and provides a complement to the more performative and processual based interventions.